A recent 24 hour session on my local southern syndicate resulted in three lovely mirrors and one of the most memorable trips I’ve ever had. 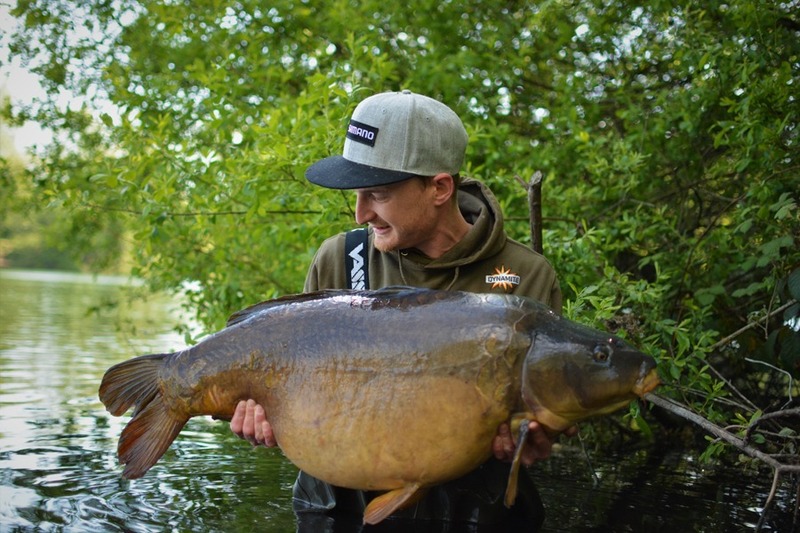 I popped down to the lake one afternoon to do some pictures for my best pal Ash Bailey as he had really hit it off banking 5 fish in short succession. Another mate of mine was in the peg next door and was leaving around 4pm after having a couple that day. A celebratory social with Ash for the night was a certain especially as the kit was in the van. I wasted no time finding three separate spots amongst the Canadian weed, believe me they were far from clear dragging that hideous binding silk weed back every time but a drop was a drop and that’s all that was available. 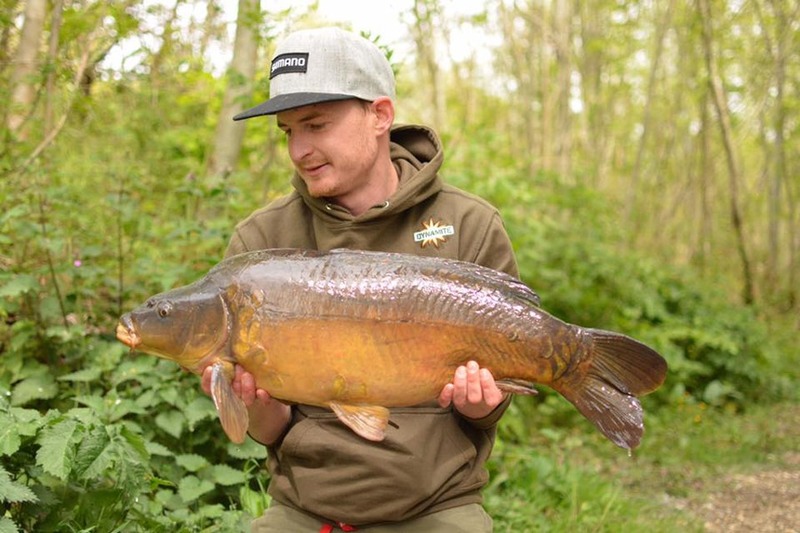 Three reverse combi rigs were placed over the top (it’s my favourite rig and my rig box is rammed with them) tipped with 15mm Monster Tiger Nut pop-ups and surrounded with half a dozen Spombs of Tiger Nut and Red-Amo boilies mixed with a jar of natural Frenzied Hemp. The first bite came at 3am shortly after a tench on the same rod, an upper double maybe scraping 20 if I’m lucky. It was really misty so there was no chance of night shots so I popped her in the sling and waited for morning. Morning came and this is when the carnage really started, shortly after I woke up I could hear Ash’s spoon ringing away in his cup so up I popped and wandered over ready to for some pics. Well in the time it took me to get out the sleeping bag he had a bite, and then another and another all in quick succession just like the morning before, in fact his second and third bite came within seconds of each other playing two simultaneously. Along with helping Ash with his morning mayhem I was waiting patiently for a couple of quick snaps of the one during the night, a moment finally came and as soon as I picked this little mirror up, my middle rod was away. Typically after patiently waiting around the opportunity arose and I get a bite straight away, to be honest I didn’t care given the lakes stock I knew what was on the end had to be bigger. 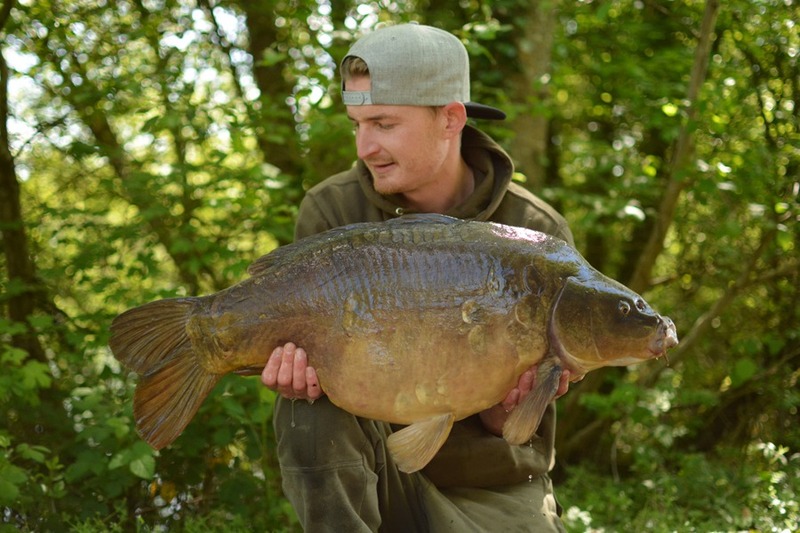 Within seconds of picking up the rod the fish had dived into a mega thick weed bed and wasn’t budging, I held the pressure on for a few moments but a hook pull was all that seemed possible. I slackened the line slightly and I could feel the weed bed releasing its pressure slightly, one quick heave a couple of head shakes from the fish and she was out. Once the typical manic flurry under the rod tips was over I slipped the net under a absolutely stunning 27lb 10oz mirror. I was so happy a 24 hour celebratory trip had turned into two fish and the morning wasn’t even over. 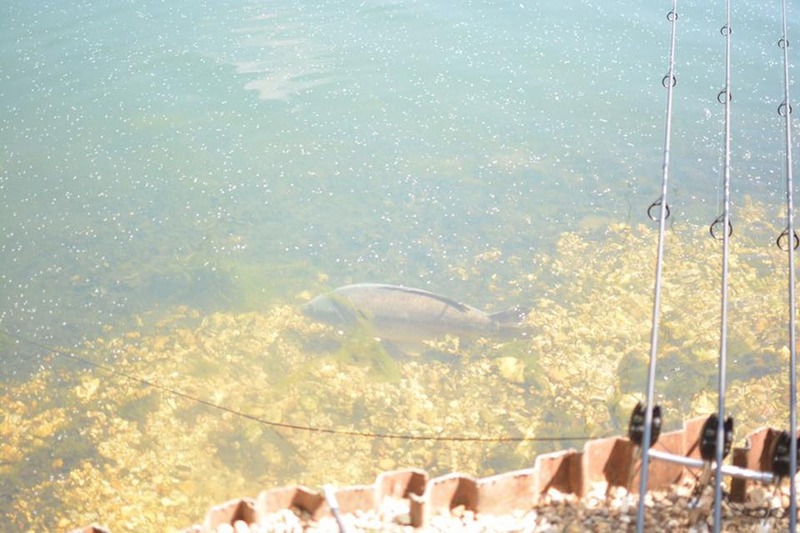 Straight after Ash was in again, I re-positioned my rod, made sure the fish was secure for a moment and wondered over. Ash had banked his fourth of the morning and with how quickly it was all happening the four nets between us were full and some more pictures were certainly in order. Ash had three in his peg so we decided to free up a couple of his before turning to the lone warrior the other side of the hedge row. Just as I was taking a couple of extra shots of the final side, beep beep beep beeeeeep, my right rod was in melt down. The tip bent right round peeling line of the spool at speed with a pretty tight drag. I lifted into it and just could stop her going, the amount of line stripped off in the take was unbelievable, charging through weed beds and making it really tough and heart pounding to retrieve feeling all the jerks and lines flicking dragging her back through. Once I had cleared her of the weed bed she had charged through she hit the surface and ‘oh my’ did she move some water before kiting to my left wanting to go on another charge. I pumped as much as I could trying to gain every yard before she had got to the left hand margin expecting her to take more line which she did, I knew this was a good fish. Before long her head was turned and she started to tire, I wasted no time getting her in the net before she plucked up the courage to charge once more. 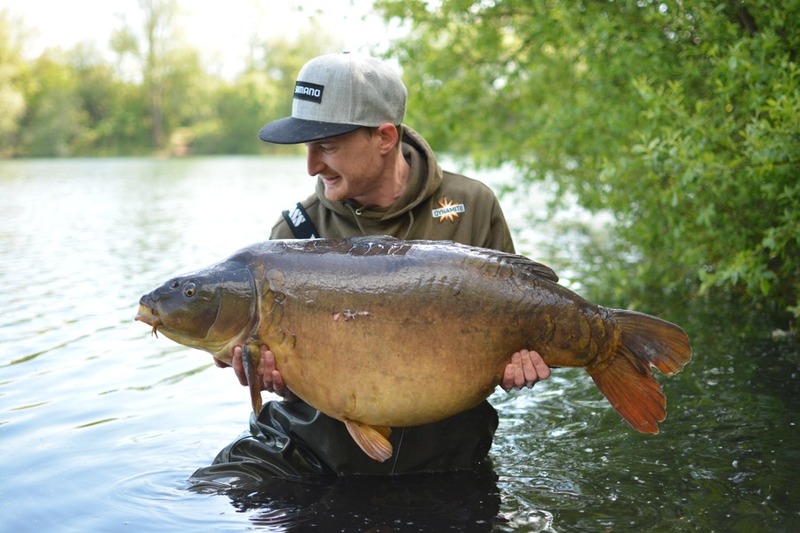 A bit of teamwork from Ash and in the net she went, 44lb 4oz of stunning long, dark, British mirror carp, one known as the ‘Brown One’s Mate’ and certainly one of most sought after in the pit. Huge thanks to Ash for all the wonderful shots he did for me and also just for the memory of the best trip that I think I will ever have, both banking 40’s on the same day and a number of fish between us to back them up.